When you first open Jaksta Recorder for Slingbox, you'll be presented with the main screen. Log in to your account on the Slingbox support site. All of the information about your Slingboxes will be displayed once you log in. Copy the Slingbox ID to the clipboard. Click the Select a Slingbox > New Slingbox menu to display the Slingbox Settings dialog. Password:: The password is the same password that you selected when setting up your Slingbox. Recording Settings Tab: Change these settings if you'd like a different size or quality to be recorded. 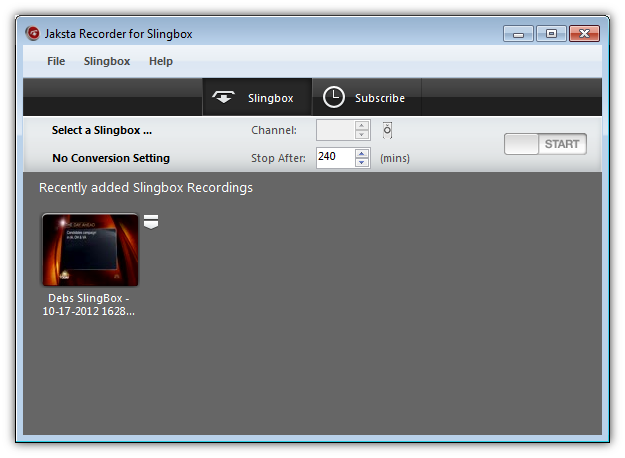 Jaksta Recorder for Slingbox uses the best possible recording quality by default. Key Map Tab: Allows the keymap to be changed that is used to change channels. Be sure to disconnect your session on Slingbox.com before you attempt to connect with Jaksta Recorder for Slingbox. The two cannot be connected at the same time. Note: The IP/Slingbox ID field can also accept the IP address of your Slingbox. We recommend connecting with your Slingbox ID, but if you'd like to use the Private IP address and port of your Slingbox, you can do so. Separate the IP and Port with a colon like this (192.168.1.5:5001). Media Folder: This is the root folder where your media will reside. Thumbnails Per Page: The number of thumbnails that appear in the Library after which a "More" icon will appear. Clicking this icon will display the next page of items. Clear library after exit: When checked this will clear the library of all media when the application is exited. No media files will be deleted. Delete to recycle bin: When checked deleting an item will move it to the recycle bin. Unchecked and the file will be deleted. Use IE Proxy settings: When checked the application will use Internet Explorers proxy settings. Player/Choose based on Windows file association: When checked the player associated with the items file extensions will be used. When unchecked the Jaksta Media Player will be used. If it is not installed you will be prompted to download and install it. Click the Start button to record the current channel. Enter a channel number, then click Start. Jaksta Recorder for Slingbox will change the remote TV to the channel number you specified. By default, Jaksta Recorder for SlingBox will save recordings in ASF format. The Slingbox module contains a drop down list of preset conversion settings in the toolbar. Selecting a preset from this drop down means that any recording or conversion started after the preset is changed will be converted to that format. 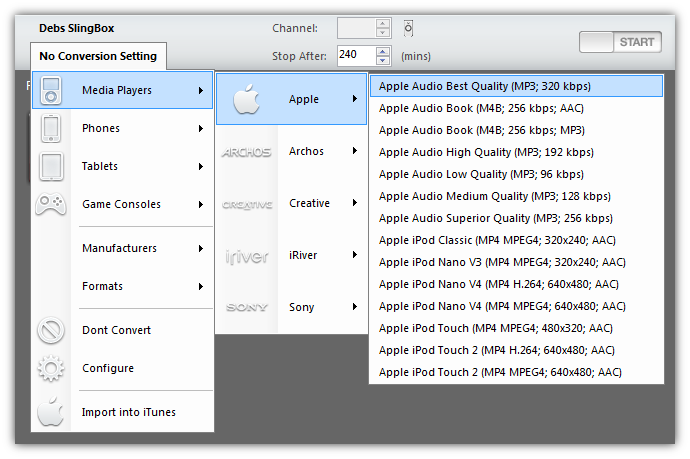 To automatically import recorded and converted media into iTunes, select an iTunes supported conversion settings and check the Import into iTunes item at the bottom of this menu. 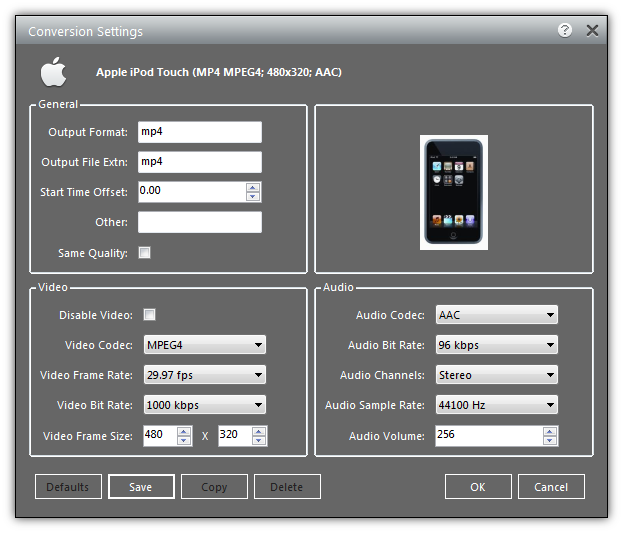 For more information on the conversion settings options please refer to the FFMPEG help: http://ffmpeg.org/ffmpeg.html. The scheduler takes into consideration the timezone of the source and also handles changes in daylight savings between the source and you. The application does not need to be running when a recording is scheduled. It will automatically start. Slingbox: Select the configured Slingbox. Duration: The duration of the recording after which time it will be stopped. -1 is no duration. TZ: Time zone of the start date and time. This will be used to schedule the task at the correct time on your machine. Each time a schedule task occurs the start time is updated against the timezone to take into account daylight savings changes or your machine and this TZ. Schedule: The days of the week on which the scheduled task will run. If you dont select days then a once off task will be created at the Start date and time. 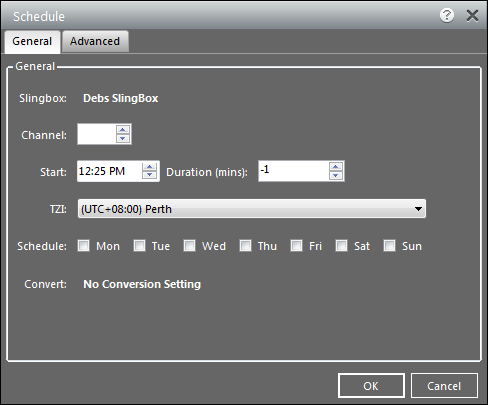 You can export your schedules to a file and move them to Jaksta Recorder for Slingbox running on another machine. Use the Export/Import menu items under the Schedule menu. Schedule Tasks are infact Windows Task Scheduler Tasks. You can edit any features that the Windows Task Scheduler supports through the Windows Task Scheduler itself.